The Penguin Press, New York, 2009. 112 pages. 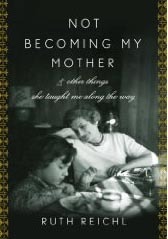 Not Becoming My Mother is a quick read that will leave you with a meditative smile. Ruth Reichl explores her memories of her mother along with a collection of letters she left behind. She muses that her mother wanted Ruth's life to be very different from her own, which indeed it was. In Ruth's mother's day, marriage and a career were mutually exclusive. She made choices based on what her own mother wanted. She worked hard to make sure that her daughter would not follow that pattern. This little book gets the reader thinking, along with Ruth, about life choices and mother-daughter patterns. In her own oblique way Mom passed on all the knowledge she had gleaned, giving me the tools I needed not to become her. Believing that work, beauty, marriage and motherhood were the forces that had shaped her destiny, she tried to teach me how to do better at each of them than she had. . . . Growing up, I was utterly oblivious to the fact that Mom was teaching me all that. But I was instantly aware of her final lesson, which was hidden in her notes and letters. As I read them I began to understand that in the end you are the only one who can make yourself happy. More important, Mom showed me that it is never too late to find out how to do it.